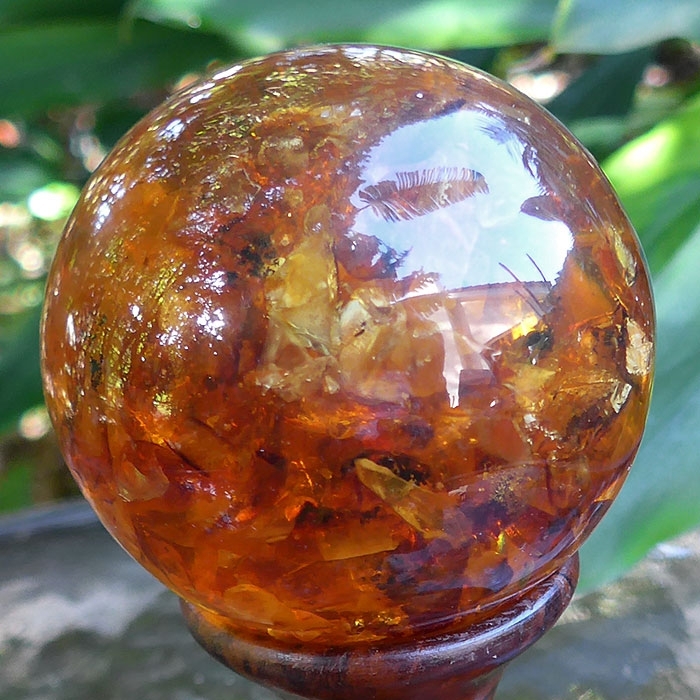 Dimensions (HxWxD): 3" x 3" x 3"
This 3 inch diameter Amber Composite Sphere, weighing 8.6 oz., or 245 grams, has beautiful color and inclusions typical of amber. This amber stone is the perfect size to hold in the hand during meditation or to place in your altar. 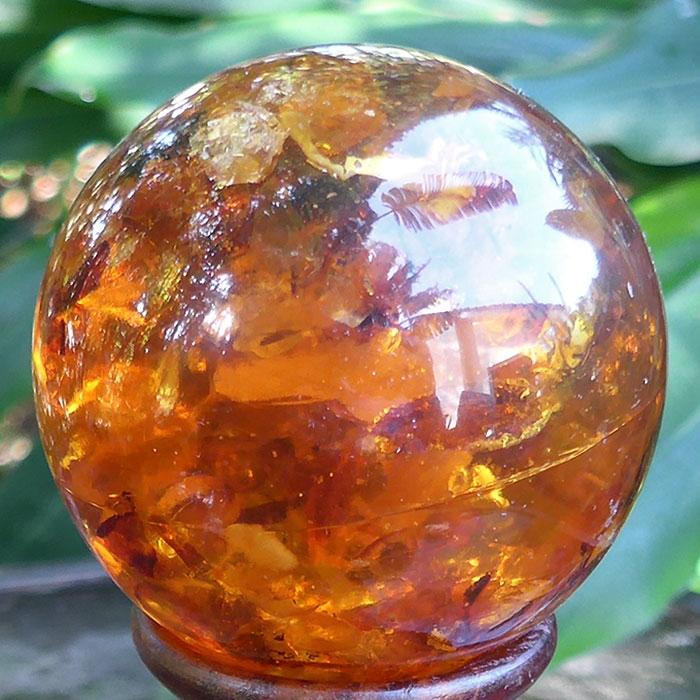 This amber sphere comes complete with its own FREE display stand for your convenience. Amber is one of the few non-mineral gemstones popular with lovers of fine jewelry throughout the ages. Amber is fossilized tree sap which is on average 30-90 million years old. Amber talismans and other amber artifacts dating from the Stone Age abound in archaeological sites in Prussia, Denmark and Schlesswig-Holstein. Amber is a stone of purification, cleansing and personal empowerment, sacred to Shamanistic practitioners and spiritual healers around the world for aeons of time. 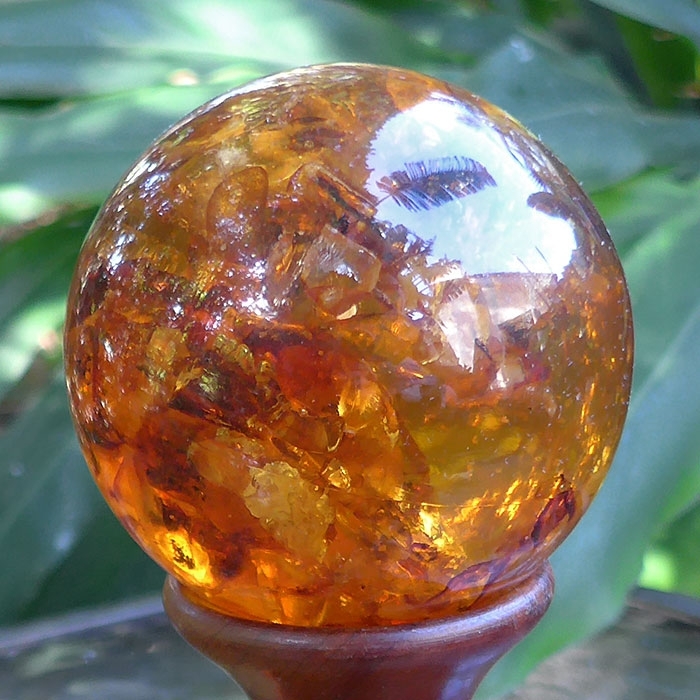 Crystal healers use amber to transmute negative energies into positive energies. Prehistoric shamanistic practices included the burning of amber in fire ceremonies designed to cleanse the environment of all detrimental influences. Amber is considered to be a golden stone of manifestation, empowering the bearer to manifest their desires and dreams into material reality, bringing love into one's life, strengthening marriage vows, and bringing good luck and protection to spiritual warriors. In Greek mythology, Phaeton, beloved son of the Sun-God Helios, borrowed his father's chariot, the vehicle of the Sun, and drove the chariot too close to the Earth, scorching the landscape. Zeus, enraged at this rash disruption of the harmoy of the spheres, hurled a thunderbolt at the young upstart, catapaulting him to his death, plunging him into the river Eridanus. "In pity for the unceasing grief of Phaëthon’s sisters, Zeus turned them into poplars, from which, it was believed, their tears oozed forth and became amber, the stone of light; a poetic fancy due to the association of êlectron 'amber' with êlectôr 'the beaming sun,' " explains British Hellenic scholar L.C.L. Smyth in his description of Aeschylus' lost play The Heliades. The golden color of amber signals a resonance with the crown chakra, which is considered to be gold, violet or white in the Western chakra system. 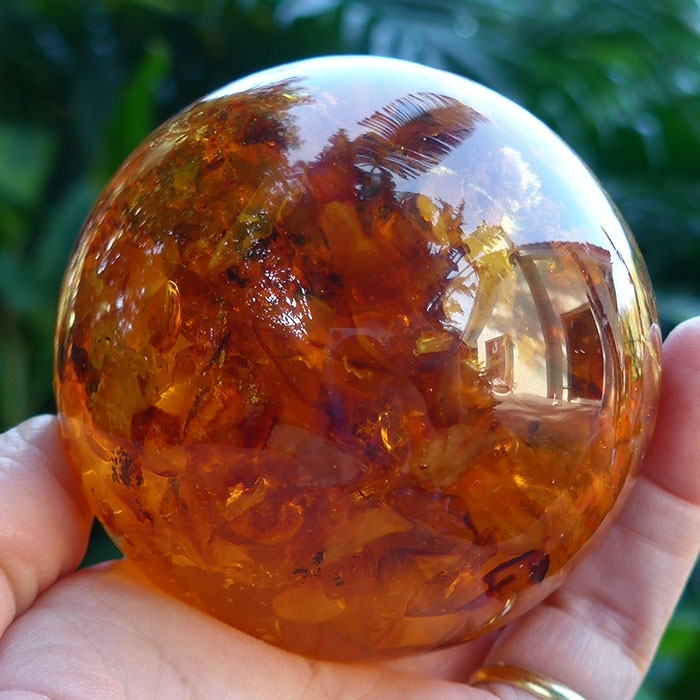 Working on the seventh, or crown chakra, amber opens the gateway to Higher Mind, strengthening the energetic connection between the personality and the Higher Self, and helping us to achieve conscious awareness of our Higher Purpose in everything we do and say throughout our busy lives. Crystal balls can be charged with Reiki energy, placed in the sun -- and in moonlight -- for additional energizing, and then placed on an altar or elsewhere in any room to subtly alter the energy in the space. Crystal balls radiate a vibration of unity, and can be excellent doorways to higher realms, so they can be a point of contact with spiritual guides and teachers, both those in physical bodies at this time and those whose energies are primarily elsewhere. This gemstone specimen has been cleaned with Universal Life Force Energy, and given an energy attunement using Reiki, a Japanese technique of energy healing, so it will continue to receive and transmit Universal Life Force Energy direct from the Source of Creation. It has also cleaned and charged with the natural energy of sunlight. It is ready for you to program according to your own needs and desires. Above weight is shipping weight. Net weight of this specimen is 8.6 ounces or 245 grams.